“Greg Inglis is on about a million a year so Souths now have 1.5million out of their cap,” Weidler told Nine’s 100% Footy. 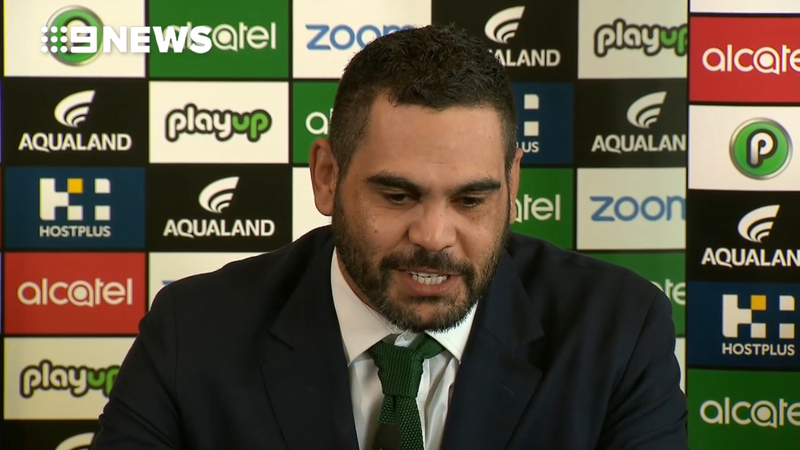 “So what they’re going to try to do is, they’re going to put in a submission to the NRL and say: ‘This is out of our cap, we can spend it now because Greg Inglis has decided to walk away from that money,’ which is quite remarkable. “If he suddenly gets $800k for doing community work, they’re going to say ‘Hang on, that’s not quite right, that should go in the salary cap’. So it’s going to be watched closely by other clubs. “The NRL will ask if Souths are paying him a wage, they’ll say to Souths: ‘What are you paying Greg Inglis? We want to know.’ How do you justify it? “What is an ambassador worth, or what is a junior coach worth or someone who is a mentor at the club? It’s a hypothetical scenario that incensed Panthers supremo Phil Gould who scoffed at the suggestion and took aim at Weidler’s “trivial” claim.